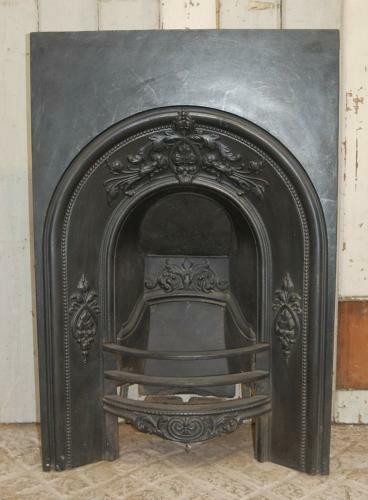 A decorative Victorian cast iron fire insert for a bedroom that is suitable for decorative use. The insert is designed to sit within a fire opening and can be paired with a fire surround. The fire is very ornate with a beautiful acanthus leaf and flower design around the arched border, below the front bars and above the concrete fire back. The fire has the original front bars and smoke flap but the smoke flap does not stay seated at the back of the fire and will need securing by purchaser. The fire has some slight signs of use and wear, as expected of antique items. The back has surface rust as expected. The front face has some small scratches, scuffs and marks and some very small patches of surface rust. There is some slight damage to the concrete back and is loose. The smoke flap has surface rust and is quite weak and showing signs of age. The fire is suitable for decorative purposes only. The fire insert is ideal for adding character and style to a hearth and is a lovely example of Victorian design.